Background Annual influenza vaccination was considered mandatory not only for health-care workers but for nursing students as well. Receiving the vaccine will help to decrease morbidity related to seasonal flu in health-care settings. Nursing faculties play a significant role as a model for their students as future nurses in attaining high level of compliance with the vaccine. Aim The study aimed to assess the faculties’ and nursing student’s compliance with seasonal influenza vaccination. Design This was a cross-sectional descriptive study. Setting The study was carried out during the 2 days’ flu vaccine campaign held in College of Nursing, Jeddah, King Saud Bin Abdel Aziz University, for health sciences in November 2016. Patients All students and faculty were recruited in the study. Tool An influenza vaccination’s compliance-structured questionnaire was used to collect data. Results Vaccination coverage rate was 60.9% among nursing students, while it was 43.3% among the faculty, 20% of total patients received the flu vaccine for the first time. The study revealed that the main reasons for receiving the vaccine were reduction of frequency and severity of flu attack after receiving vaccine in the previous years. However, the most common reasons for not being vaccinated were having concerns about vaccine safety, especially among pregnant students, negative personal experience, and known allergy to chicken eggs. In addition, the study revealed that the main source of information about the vaccine campaign was through the college announcement, either by e-mail or posters. Conclusion From the results of the current study, we can conclude that the immunization rate among students and faculty fall below the healthy people target, and their compliance was not related to their demographic characteristics. Recommendation The study recommended dissemination of information about vaccine safety and benefits among nursing students and faculties. Development of policy to mandate flu vaccine administration in nursing colleges should be enforced. Influenza is considered an important clinical, epidemiological, and economic public health challenge. This common infectious and communicable disease is the cause for high morbidity and mortality rates worldwide. The attack rates of seasonal influenza ranged between 10 and 20% in healthy adults, but this rate exceeds during hospital breaks and long-term care facilities. The Centres for Disease Control and Prevention (CDC) in 2013 estimated that this viral infection can result in more than 200 000 hospitalizations and 3000–49 000 fatalities every year (CDC, 2013). Influenza pandemics have been recognized as the largest and deadliest epidemics in human history, including Ancient Greece, and in reports during the middle Ages and the Renaissance. Four pandemics have been reported since 1918, each with different characteristics (Lina, 2008; CDC, 2015). Influenza viruses can cause disease among all age groups, but rates of infection are higher among children less than 2 years, and among persons aged 65 years and more. Patients who have medical conditions are also at greater risk to being infected with influenza. Annual immunization is the most effectual method of preventing influenza and its complications. Routine annual influenza vaccination for all persons aged more than or equal to 6 months who do not have contraindications has been recommended by the CDC and CDC’s Advisory Committee on Immunization Practices since 2010 (CDC, 2013). Influenza immunization campaigns are usually directed toward three groups of the population: individuals at high risk of influenza-related complications, those who are able to spread influenza to individuals who are at high risk of complications, and those who provide community services (Kelly et al., 2014; Shapovalova et al., 2015). Because of the nature of their job, the nurses are in contact with people who are at high risk of complications, including children, seniors, pregnant women, and people with low immunity or suffering from chronic health conditions. Many nurses also provide essential services, and their absences due to influenza attack affect the health setting’s ability to provide effective health care. Influenza immunization of health-care workers has been shown to reduce infection rates, and a growing body of evidence shows that health-care workers’ immunization can improve patient outcomes in health-care settings (Wicker et al., 2009; Wong et al., 2016). Hence, the vaccination of health-care workers can play an important role in preventive programs aimed at reducing influenza-related morbidity and mortality among high-risk patients. Encouraging health-care workers to receive the vaccine could play a vital role in preventing the transmission of flu, and thereby reduce institutional outbreaks. The WHO and CDC recommend influenza vaccination of health-care workers and those who are in regular contact with high-risk persons to prevent transmission of influenza from health-care workers to patients (Shelby (2012)). Bellia et al. (2013) stated that, the vaccination does not only protect the health-care workers and the high-risk groups from influenza, but they will act as examples for patients to follow, and increase the possibility of them recommending the vaccine to others. Influenza vaccination is effective in healthy individuals; however, its efficacy might be low in vulnerable populations such as the elderly, those with comorbid respiratory conditions and the immunocompromised. This highlights the importance of achieving high vaccination rates among healthy individuals, for example, health-care workers, to reduce the transmission. Vaccination efforts should be structured to ensure the vaccination of as many persons as possible before influenza activity in the community begins. In any given year, the optimal time to vaccinate cannot be determined precisely, because influenza seasons vary in their timing and duration, and more than one outbreak might occur in a single community in a single year. Although several studies proved that health-care workers are considered as a group having low immunization coverage rate, there is a great variation among these studies in the coverage rate. Studies showed that physicians were more likely to have been vaccinated than nurses, the main reasons for health-care workers’ noncompliance included the following: perception of a low risk of infection, fear of side effects, and doubt about the influenza vaccination effectiveness (Bonaccorsi et al., 2015). Saudi Influenza Vaccination Program, is considered part of the Ministry of Health’s ongoing preparations for the Hajj and winter seasons of 2014–2015; the Ministry has provided a seasonal influenza vaccine for the high-risk groups of influenza, including all health-care workers (physicians, nurses, and paramedical). The transmission of influenza and other respiratory tract infections during the Hajj season in Saudi Arabia is very high. For the last 10 years, pilgrims are being recommended to take influenza vaccine before attending Hajj (Alfelali and Barasheed, 2015; Zeitouni et al., 2015). 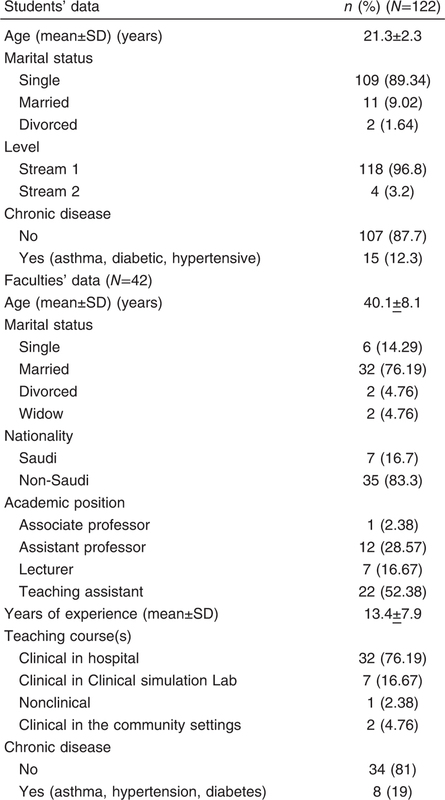 Several studies were conducted in Saudi Arabia, including a cross-sectional study to assess the knowledge, attitudes, and beliefs with regard to influenza vaccination among health-care workers in National Guard Hospital at Al Ahsa; the rate of influenza vaccine was 34.4% among all health-care workers in 2010 (Rehmani and Memon, 2010). In the 2009 study, the overall vaccination rate among health-care workers was 41% (Al-Tawfiq et al., 2009); in a recent study in 2014, the overall vaccination rate among health-care workers was 38% (Alshammari et al., 2014). Since 2003, annual seasonal vaccination campaign was being conducted during the winter season (October-February) for the health-care workers in King Abdel Aziz Medical cities in National Guard, including the western region in Saudi Arabia. Each year the campaign would include all the colleges of the University; announcement and advertisement of the campaign usually precede its timing; the infection control department is reponsible for this campaign (Al-Otaibi et al., 2010). The CDC (2007) developed their own strategy in an attempt to increase health-care worker influenza vaccination rates. The CDC began to pressurize hospitals to use declination statements or waiver form for workers who chose not to receive the flu vaccine. This form is used in the National Guard Hospitals and the University of King Saud bin Abdel Aziz University for Health Sciences. With regard to the next generation of health-care workers, including student nurses who were also patients of several researches investigating their influenza vaccination status, a study conducted in the Australian University revealed that the overall vaccination rate in 2013 was 36.3%; the rate was higher in medical students, as compared with nursing students. However, a 43.1% immunization rate among nursing students was reported in a private university in Pittsburgh (Kosharichik et al., 2012). Whalen et al. (2014) reported that the coverage rate of seasonal influenza vaccine was 39% among nursing students, while it reached 62% among nursing faculties. The main reasons for receiving the vaccine were reduction of frequency and severity of flu attack after receiving the vaccine in previous years. However, the most common reasons for not being vaccinated were having concerns about vaccine safety, especially among pregnant students, negative personal experience and known allergy to chicken eggs (Hunt and Arthur, 2012; Cornally et al., 2013; Kang et al., 2014). Nursing faculties play a significant role as a model for their students as future nurses in attaining high level of compliance with the vaccine (Whalen et al., 2014). Until now, there is no published information on the prevalence, barriers, and enablers to influenza vaccination among Saudi nursing students and their staff. The current study highlights the situation in a nursing college and assesses the faculty and teaching assistants, and students’ compliance with seasonal influenza vaccine. The aim of this study was to assess the faculty’s and students’ compliance with seasonal influenza vaccine. To assess the compliance rate with seasonal influenza vaccine among faculty and students. To investigate the reasons for receiving seasonal influenza vaccine among faculty and students. To investigate the reasons for not receiving seasonal influenza vaccine among faculty and students. What are the reasons for faculty, teaching assistants, and students for receiving seasonal influenza vaccine? What are the reasons for faculties, teaching assistants, and students for not receiving seasonal influenza vaccine? Cross-sectional descriptive study design was used to carry out the study. This study used the Health Belief Model (HBM) as the theoretical framework. This psychological model attempts to explain and predict health behaviors, and is used in assessing health-behavior interventions, by focusing on the attitudes and beliefs of individuals. It includes concepts such as perceived susceptibility, perceived severity, perceived benefits, perceived barriers, cues to action, and self-efficacy. The HBM has been used extensively to study vaccination beliefs and behaviors, and has also been used in vaccination research to identify patients’ perceptions of disease and vaccination. Student nurses perform direct nursing care in health-care settings, and are in direct contact with all types of patients including the group at high-risk for acquiring influenza and its complications. Patients and students safety can be enhanced through effective preventive procedures including influenza immunization. The study was conducted in King Saud bin Abdel Aziz University for Health Sciences in the western region, in the College of Nursing. The college was established in 2006; it provides BSN program of 4 years for secondary school students (stream 1), and a special curriculum plan for graduates with other BSN, who selected the nursing profession as a second career (stream 2). Convenient sampling technique was used to recruit the study patients. All of College of Nursing, King Saud Bin Abdel Aziz University for Health Sciences faculty (associate professor, assistant professor, lecturer and teaching assistant) were invited to participate in the study. All nursing students registered in nursing courses in the College of Nursing in the scholastic year 2016/2017 were included in the study. The total sample size was 122 students and 42 faculty. Data were collected from all participants who were willing to participate in the study. An influenza vaccination’s compliance-structured questionnaire was used to collect the necessary data. The research questionnaire was developed by the researchers after reviewing of the literature (Hunt and Arthur, 2012; Cornally et al., 2013; Whalen et al., 2014). Part I: demographic data such as age, marital status, nationality, etc. Part II: seasonal influenza vaccine experience data such as previous and current vaccination status, frequency of receiving seasonal influenza vaccine, places for receiving the vaccine, etc. Part III: the reasons for receiving seasonal influenza vaccine, the main sources of information about the seasonal influenza vaccine campaign and intention to be vaccinated in the future campaign. Part IV: the main reasons for not receiving the seasonal influenza vaccine were the allergy, negative experience, vaccine safety, etc. Content validity of the tools was tested by a group of five experts in the community health nursing field, and their opinions were taken into consideration. A pilot study was carried out on five of the nursing faculty and five of the nursing students who were excluded from the study in order to assure the clarity, applicability, and comprehension of the tool. Accordingly, the necessary modification was made. The students were approached after obtaining the list of academic levels and courses registration obtained from the department of student’s admission and registration. Arrangement was made with course coordinators for distribution of the study instrument. Once the students were recruited and agreed to participate in the study and signed the consent form, they were asked to fill the study questionnaires. The researchers distributed the research questionnaire to the students and gave them the essential instructions to fill it. The study questionnaire was distributed to the faculty and teaching assistants at their offices after filling the written consent. The questionnaire was collected by the researchers at the end of the same day. After returning the questionnaires to the researchers, data were coded and prepared for analysis. The research proposal and questionnaire were submitted to the College of Nursing Research Unit for reviewing and to give permission to conduct the study. Institutional Review Board approval was obtained. The participants were informed about the objectives of the research, and instructions were given by the researchers. Informed consent was secured from each participant, with complete assurance of their right to withdraw from the study at any time. In addition, the anonymity was assured, wherein a code number was be used to label questionnaires. After data collection, the questionnaires were handled by the researchers only, and kept in a secured place. Statistical package for the social sciences program, IBM Corp. Released 2013. IBM SPSS Statistics for Windows, Version 22.0. Armonk, NY: IBM Corp. version 22, was used to analyze research data. Descriptive as well as inferential statistics was carried out, including mean, SD, and frequencies. Correlation tests were used to investigate the relationship between the compliance of faculty, teaching assistants, and students and their demographic characteristics. [Table 1] shows the characteristics of the study participants. One hundred twenty-two female students participated in the study; their mean age was 21.33±7.31 years. Most of them (89%) were single, while only 9% were married and 9% of them had one child. Concerning the educational stream, the results revealed that the majority of them (96.8%) were in stream 1, while the rest of them were in stream 2. The study also revealed that most of the students (87.7%) had no history of chronic diseases, and those who had chronic diseases such as asthma, anemia, and diabetes constituted 12.3% of them. As regards the characteristics of the faculty who participated in the study, the results show that the mean age was 40.17±8.08 years. With regard to their marital status, more than three-quarters (76.2%) were married, while 14.3% of them were single; however, the rest of them were either divorced or widowed. As regards nationality, most of the faculty (83.3%) were non-Saudi, while the rest of them were Saudi; more than half (52.4%) of the faculty were teaching assistants, while 28.6% of them were assistant professors, and 16.7% of them were lecturers, and only one participant was associate professor. The results also revealed that more than three-quarters (76.2%) of them were teaching nursing clinical courses at the hospital, while 16.7% of them were teaching clinical courses in the clinical simulation laboratory; however, a minor percent of them were teaching either clinical community settings or teaching nonclinical courses (4.8 and 2.4%, respectively). Concerning the years of experience of the participants, the mean experience was 13.46±7.85 years. Concerning the chronic disease, most of them had no diseases (81%), while 19% of them had asthma, hypertension, or diabetes. [Table 2] represents distribution of influenza vaccination experience data among the students and faculty. The table shows that more than half of the faculty (52.4%) and slightly less than half (47.5%) of the students were receiving the flu vaccine once, while nearly a quarter of both students and faculty (25.4 and 23.8%, respectively) were receiving the flu vaccine three times or more. However, a small percent of them never received the flu vaccine before. With regard to the places where they received the vaccine, the results showed that more than half (55.7 and 57.1%, respectively) of both students and faculty received the flu vaccine at the hospital staff clinic, while approximately one-quarter (23.8 and 26.2%, respectively) of students and faculty received the vaccine at the university during the flu campaign. In contrast, 9.8% of the students and 7.1% of the faculty had never received the seasonal influenza vaccine before. The table also revealed that more than half (60.7 and 61.9%, respectively) of both students and faculty received seasonal influenza vaccine every year (on a regular base), while the rest of them did not receive it every year. Concerning the adverse effects after receiving the seasonal influenza vaccine, the table shows that more than one-third (36.9 and 33.3%, respectively) of both students and faculty never experienced any adverse effect, while 31.1% of the students and 33.3% of the faculty experienced flu-like syndrome. In contrast, 26.2% of the faculty and 18% of the students experienced local mild arm soreness. In addition, subfebrile temperature was experienced by 15.6% of the students and 14.3% of faculty. [Table 3] shows reasons for receiving the seasonal influenza vaccine among the participants following the HBM. As regards vaccine benefits, the table revealed that more than two-thirds (68.5 and 70.4%, respectively) of both students and faculty received the vaccine because they believed in the benefits of seasonal influenza vaccine in reducing the frequency of having a flu attack. However, 61.8% of students and 74.1% of faculty stated that they received the vaccine because they believed in the benefit of seasonal influenza vaccine in reducing the severity of flu attack. In addition, the fact that the seasonal influenza vaccine is offered for free was the reason for receiving the vaccine among more than one-third (37.1%) of the students and 48.1% of the faculty. With regard to the perceived susceptibility, the table shows that more than half (58.4 and 63%, respectively) of both students and faculty received the vaccine because they believed that seasonal influenza vaccine protects nurses, as they are at risk of developing influenza illness. Concerning the efficacy of the vaccine, the table revealed that 56.2% of the students and 50.3% of the faculty received the vaccine because they believed that influenza vaccine remains the most effective measure for prevention of outbreaks among health-care workers. However, the seasonal influenza vaccine protects against the risk of H1N1 and Corona virus, which was the reason given by 38.2% of the students and 48.1% of the teaching staff. In contrast, one-third (32.6%) of the students and 44.4% of the faculty received the vaccine because it is mandatory. The table also revealed that 51.9% of the faculty and only 27% of the students received the seasonal influenza vaccine, because they believed that the seasonal influenza vaccine protects against the risk of respiratory infections during the season of Hajj, which reflects their perceived efficacy. [Table 4] shows reasons for not receiving the seasonal influenza vaccine following the HBM. With regard to the severity of flu, the table shows that 46.9% of the students and 26.7% of the faculty who did not receive the vaccine reported that they do not think that the seasonal influenza vaccine is necessary. The table also revealed that more than one-fourth (28.1%) of the students and none of the faculty receive the vaccine because they think influenza is not a serious disease. With regard to their susceptibility to flu, more than one-fourth (28.1%) of the students and 13.3% of the faculty, stated that they never suffered from influenza, as a reason for not receiving the vaccine. In contrast, more than one-tenth (15.6%) of the students and none of the faculty received the vaccine because they believed that they are not in contact with patients; hence influenza is not a risk for them. Concerning the efficacy of the vaccine, more than a fourth (26.7%) of the faculty and 12.5% of the students did not receive the vaccine, because they think that the seasonal influenza vaccine had no positive effect on the frequency and severity of the influenza attacks. The participants reported several barriers that affect their decision to receive the vaccine. Nearly equal percentage of both students and faculty (12.5 and 13.3%, respectively) did not receive the vaccine, because they had concerns about the seasonal influenza vaccine safety during pregnancy. However, more than half (60%) of the faculty and only 9.4% of the students did not receive the vaccine, because they had previous negative personal experiences. However, 6.3% of the students and 6.7% of the faculty did not receive the vaccine, because they have allergy to chicken eggs. The table also revealed that more than one-third (33.3%) of the faculty and only 6.3% of the students did not receive the vaccine, because they had a previous severe reaction to the seasonal influenza vaccine, while more than a fourth (21.9%) of the students and 6.7% of the faculty did not receive the vaccine, because they had concerns about autoimmune disorders. [Figure 1] represents the vaccination status of students and faculty. Figure 1 The vaccination status of students and faculty. Nearly three-quarters (73%) of the students and less than two-thirds (61.9%) of the faculty received the seasonal flu vaccine, while the rest of them did not receive it; the majority of the faculty (92.6%) and more than half (56.2%) of the students had intention to receive the flu vaccine in the next year; however, the rest of them had no intention. 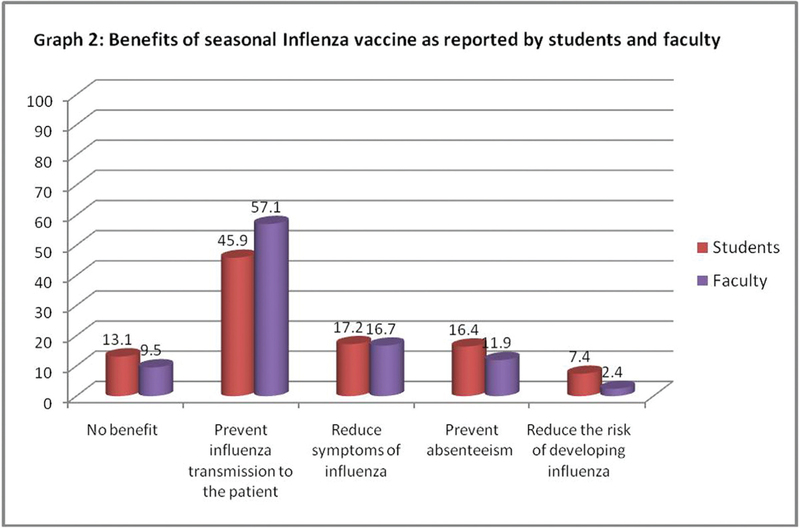 [Figure 2] shows the benefits of receiving the seasonal flu vaccine, as reported by the students and faculty. 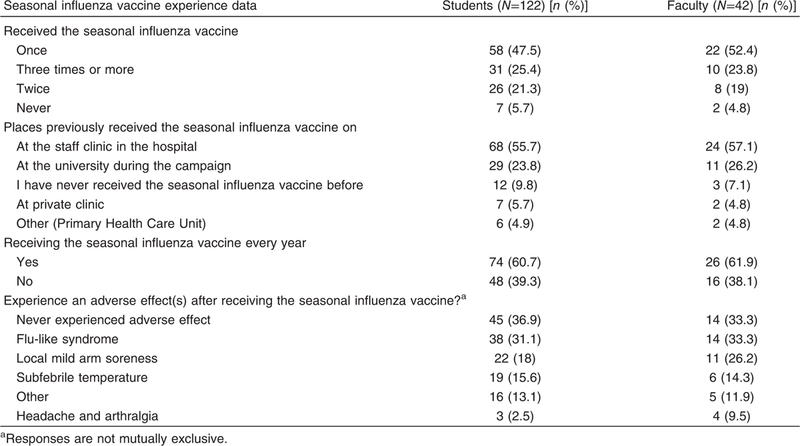 Figure 2 Benefits of seasonal influenza vaccine as reported by students and faculty. The graph revealed that 57.1% of the faculty and 45.9% of the students reported that seasonal flu vaccine prevents transmission of flu among patients as the first perceived benefit, while a nearly equal percentage of both students and faculty (17.2 and 16.7%, respectively) reported that the vaccine reduces the symptoms of the flu as the second benefit. However, prevention of absenteeism was the benefit reported by 16.4% of the students and 11.9% of the faculty, while a minor percent of the participants (7.4 and 2.4%, respectively) of both students and faculty reported reducing the risk of developing influenza as benefit of receiving the flu vaccine. Those who reported no benefits of the flu vaccine constitute 13.1% of the students and 9.5% of the faculty. 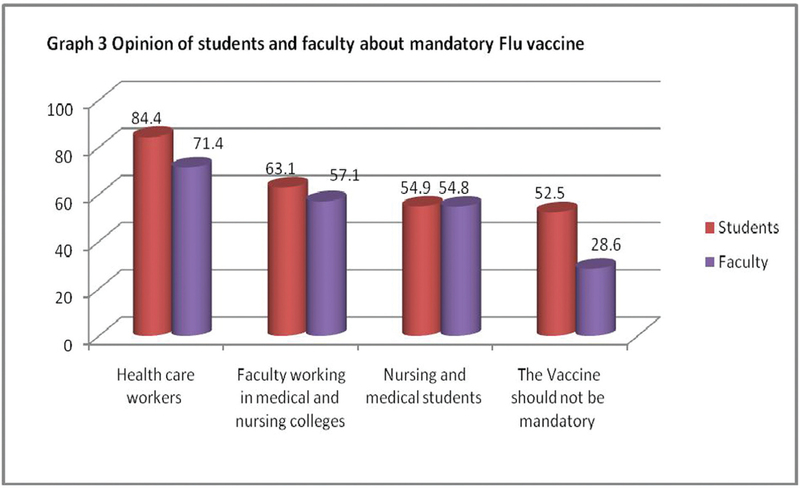 [Figure 3] shows students’ and faculty’s opinion about the mandating of flu vaccine. Figure 3 Opinion of students and faculty about mandatory flu vaccine. The graph shows that most of the students (84.4%) and 71.4% of the faculty perceived that the vaccine should be mandatory to health-care workers, while more than half (63.1 and 57.1%, respectively) of both students and faculty stated that the vaccine should be mandatory for faculty working in medical and nursing colleges. However, approximately half (54.9 and 54.8%, respectively) of both students and faculty mentioned that the vaccine should be mandatory for medical and nursing students. In contrast, those who reported that the seasonal influenza vaccine should not be mandatory constitute 52.9% of the students and 28.6% of the faculty. The study results revealed no significant relations between the participants’ compliance (students or faculty) toward receiving flu vaccine and their demographic characteristics, clinical experience, or teaching courses. Several international recommendations include health-care workers as a priority group for annual influenza vaccination; achieving compliance among health-care workers such as faculties as well as nursing students is a complex process and is affected by a wide variety of complex factors. Despite the fact that health-care workers are more vulnerable, especially nurses, to catch influenza and that they play a crucial role in transmitting the infections to their patients, in addition to multiple well documented benefits, the flu vaccination coverage is still low among them, especially among nurses (Alshammari et al., 2014). In the present study, more than half of the faculty and nearly three-quarter of the students received the flu vaccine in the study year; a lower percentage was reported by many studies such as Rehmani (2010) study, which reported that 34.4% of health-care workers in Saudi Hospital received the flu vaccine in 2008/2009; in addition, Kosharichik et al. (2012) reported that 43.1% of nursing students received the flu vaccine in the USA, and Alshammari et al. (2014) reported that 38% of Saudi health-care workers received the vaccine. However, CDC (2011) estimated that 63.5% of health-care personnel received the flu vaccine, which came in line with the current study. Another study conducted by Whalen et al. (2014) in South Florida revealed nearly similar results with regard to the faculties’ vaccination coverage, while a lower percentage was reported related to students, as 39% of nursing students received the vaccine. With regard to being vaccinated against influenza on a regular basis, the current study revealed that more than half of students and faculty received the flu vaccine every year. These results disagree with other studies that revealed a lower percentage, such as the Hunt (2012) study in Nottingham, which revealed that 12.2% of student nurses reported being vaccinated against influenza on a regular basis. This disagreement could be explained by the impact of the active students’ involvement in the administration of flu vaccine during the yearly campaign conducted in the college. Concerning the intention of the study participants (students and faculty) to receive the flu vaccine in the upcoming years, the current study revealed that the majority of the faculty and more than half of the students had intention to receive the vaccine the next year. This result came in agreement with Ofstead et al. (2008) who conducted a study in Mayo Clinic Vaccine Research Group, USA, which reported that 65% of the nurses had intention to receive the vaccine. In contrast, the study result disagreed with the study by Rehman (2010), which revealed that 63% of health-care workers had no intention to receive the flu vaccine the next year, while Hunt (2012) reported that a very low percent (19.8%) of the nurse students had an intention to receive the flu vaccine the next year. This dissimilarity could be interoperated by the positive perception of the students, of their risk for contracting flu due to the geographical position of the University to Makka, which had the highly crowded special annual event (Hajj). CDC advisory committee on immunization 2011 has recommended annual vaccination of health-care workers since 1981, as well the American Nurses Association (2015) passed a resolution stating that influenza vaccination of registered nurses and other health-care providers is patient care safety as well as an ethical responsibility. In the current study, most students and faculty believed that the influenza vaccination should be mandatory for health-care workers; furthermore, more than half of them thought it should be mandatory for faculty working in medical and nursing colleges; however, a nearly similar percentage of both students and faculty thought it should be mandatory for medical and nursing students. These results came in line with Douville et al. (2010) who reported that 70% of health-care workers thought the flu vaccine should be mandatory to health-care workers in the study named ‘Health Care Worker Knowledge, Attitudes, and Beliefs Regarding Mandatory Influenza Vaccination’ conducted in an American tertiary children’s hospital. This result could be clarified by the fact that the students in the college receive their clinical training in an internationally accredited hospital, which had a policy for mandating flu vaccine for all health-care workers. According to HBM, which actually used to examine people’s motivation for adapting healthy behavior or decision, the results of the current study indicate that nursing faculty and nursing students were governed by different complex factors with regard to their decision to receive the seasonal influenza vaccine. Among those who received influenza vaccine, the following perceived benefits were the main reasons that motivated them to receive the vaccine: positive effect of the influenza vaccine in reducing the frequency of having flu attacks, as it was reported by more than two-thirds of both students and faculty. Second, the reported perceived benefits, as reported by more than half of the students and nearly three-quarters of faculty, was the positive effect of flu vaccine in reducing the severity of flu attack. The flu vaccine being offered for free was the perceived benefit for less than half of students and faculty. However, more than half of the faculty and less than half of the students, either those who received or did not receive the vaccine, reported that flu vaccine prevents transmission of influenza to the patients. These results came in line with the results of many studies that revealed nearly similar benefits in addition to other benefits; the Hunt (2012) study revealed two perceived benefits to receiving flu vaccine among nursing students, including offering the vaccine for free, as reported by 18.5% of them, in addition to the perceived self-protection as well as patient protection, as reported by more than one-tenth of the participants. Another study conducted by Rehmani (2010) found that the most frequently cited reason, for receiving the flu vaccine among health workers in Saudi Hospital was the perceived self-protection, as reported by 59% of them followed by patients protections. However, the Al-Tawfiq et al. (2009) study, in Saudi Arabia, revealed that the perceived personal need was the more common reason, for receiving the flu vaccine among 69.7% of the participants, followed by protection of patients and offering the vaccine for free. Generally, the main perceived benefits of the flu vaccine in many studies are self-protection followed by patient protection (Smedley et al., 2007; Hollmeyer et al., 2009). With regard to the perceived efficacy as the motivating factor to receive the flu vaccine among study participants, the results of the current study revealed that four statements were reported including the following: The seasonal influenza vaccine remains the most effective measure for preventing outbreak among health-care workers, as reported by more than half of both students and faculty, and the seasonal influenza vaccine protects against the risk of H1N1 and Corona virus, followed by the vaccine being mandatory and, finally, the seasonal influenza vaccine protects against the risk of respiratory infections during the season of Hajj, as reported by 27% of students and 51.9% of the faculty. These results came in agreement with the results of other studies that indicated nearly similar perceived efficacy to receive the flu vaccine. Hunt (2012) reported that 17.4% of the participants received influenza vaccine because it was recommended, while the Rehmani (2010) study reported that 88.6% of health-care workers in Saudi Hospital received the flu vaccine, because they believed that the flu vaccine is effective in reducing the risk of influenza, in addition to it being recommended by supervisors, as reported by 24% of them. However, Kosharichik et al. (2012) reported that 16% of the studied nursing students received the flu vaccine because it was their parent’s suggestion, and 11% of them received the vaccine because it was a health-care personnel suggestion.Concerning the perceived susceptibility, the present study revealed that more than half of students and one-third of the faculty received the flu vaccine because they perceived themselves at risk of developing flu. This result came in agreement with Hunt (2012) study, which revealed that 42.4% of the nursing students received the vaccine for the same reason. These results reflect the fact that all nursing students all over the world shared the same perception of susceptibility for contracting flu while caring for patients during their clinical training. Perception of severity, susceptibility, as well as self-efficacy and barriers have been proven to be associated with the compliance of health-care workers to flu vaccine (Al-Tawfiq et al., 2009). Previous negative personal experience was reported as a perceived barrier among those who did not receive the flu vaccine, as reported by 60% of the faculties and only 9.5% of students, with significant difference between groups. This result is logically explained by the difference in mean age between the faculties and students. Other perceived barriers include having concerns about flu vaccine safety, having previous severe reactions to flu vaccine, as well as having concerns about autoimmune disorders and having allergy to chicken eggs. These results disagree with Hunt’s (2012) study, which reported other different barriers among the participants such as fear of possible side effects, cost, as well as fear of injection. While another study reported worry about side effects of flu vaccine as the first reported barrier by 32.1% of the participants, in addition to being afraid of injection and lack of access, as reported by 21.7% (Rehmani and Memon, 2010). However, Kosharichik et al. (2012) reported the same barriers in addition to time limitation as barrier. The Al-Tawfiq study reported different perceived barriers such as nonconvenient clinics, fear of the vaccine itself as well as fear of the needle. This disagreement could be explained by difference in study patients and setting, vaccine regulation in each study and, in addition, in the current study, the vaccine was accessible and there was no time limitation. With regard to the perceived severity as barrier to receive the flu vaccine, the current study revealed that less than half of students and nearly one-fourth of the faculty perceived that seasonal influenza flu vaccine is not necessary, while more than one-fourth of students and none of the faculty believed that influenza is not a serious diseases, with a significant difference between the groups, which reflects the lack of knowledge among nursing students with regard to the severity of the disease as well as the effectiveness of the flu vaccine, which indicates the necessity of the awareness program to educate them about the seriousness of the effect of flu on their health as well as on their patients. These results came in line with Rehman (2010) study, which reported that 21.4% of health-care workers in Saudi Hospital did not received the flu vaccine, because they believed that flu is not a serious disease. Concerning the perceived susceptibility, the present study reported that more than one-quarter of students, and more than one-tenth of the faculty did not receive the flu vaccine, because they never suffered from influenza. However, 15.6% of the students and none of the faculty who did not receive the flu vaccine perceived themselves as not being at risk to contract flu, because they are not in direct contact with the patients, which also reflects lack of awareness and knowledge among nursing students about the risk factor, transmission, and seriousness of the disease. The same results were reported by different studies, which revealed that health-care workers perceived themselves as not at risk to contract flu (Nichol et al., 2008). With regard to the perceived efficacy, in the current study, more than one-tenth of students and more than one-fourth of the faculty did not receive the flu vaccine, because they believed that the flu vaccine had no positive effect on the frequency and severity of flu attack; this came in accordance with many studies, all of which reported that the study participants did not receive flu vaccine, because they believed that flu vaccine is not effective in disease prevention, or they were unaware of the flu vaccine value. This result necessitates the importance of awareness campaign directed toward the benefits of the vaccine. From the results of the current study, it was concluded that the immunization rate among students and faculty fall below the healthy people target of 90% flu immunization for all people aged less than 65 years (Shefer, 2010). In addition, the compliance of nursing students as well the faculty is not governed by their demographic characteristics nor their clinical experience or teaching course. It was only governed by their perception and beliefs with regard to the flu severity, efficacy of the vaccine, perceived benefits of the flu vaccine and their susceptibility to flu as well as their previous negative experience. Dissemination of information about the vaccine benefits, safety and efficacy among nursing students. Effective announcement about flu campaigns and motivation of the nursing students and faculties to receive the vaccine. Further qualitative study to assess the student perception towards different aspects in HBM to improve their compliance. Enforcement of policy and legislation to mandate the flu vaccine for health-care workers and students. The authors thanks to the faculty and students who participated in this study; special acknowledgement for the graduate Wejdan Shegege for her assistance in data collection and data entry. Al-Otaibi BM, El-Saed A, Balkhy HH (2010). Influenza vaccination among healthcare workers at a tertiary care hospital in Saudi Arabia: facing challenges. Ann Thorac Med 5:120–121. Alfelali M, Barasheed O (2015). Changes in the prevalence of influenza-like illness and influenza vaccine uptake among Hajj pilgrims: a 10-year retrospective analysis of data. Vaccine 33:2562–2569. Alshammari TM, Al Fehaid LS, AlFraih JK, Aljadhey HS (2014). Health care professionals’ awareness of, knowledge about and attitude to influenza vaccination. Vaccine 32:5957–5961. Al-Tawfiq J, Antonyb A, Abedb M (2009). Attitudes towards influenza vaccination of multi-nationality health care workers in Saudi Arabia. Vaccine 27:5538–5541. American Nurses Association (2015). Position Statement on IMMUNIZATIONS (Revised Position Statement) July 21, 2015. Available at: https://www.aorn.org/-/media/aorn/guidelines/position-statements/posstat-endorsed-ana-immunizations.pdf. Bellia C, Setbon M, Zylberman P, Flahault A (2013). Healthcare worker compliance to seasonal and pandemic influenza vaccination. Influenza Other Respir Viruses 7(Suppl 2):97–104. Bonaccorsi G, Santomauro F, Porchia BR, Niccolai G, Pellegrino E, Bonanni P, Chiara Lorini C (2015). Beliefs and opinions of health care workers and students regarding influenza and influenza vaccination in Tuscany, Central Italy. Vaccines (Basel) 3:137–147. CDC. (2007). Use declination statements on flu vaccine: pressure grows to document why HCWs decline. Hospital Employee Health 26:102–103. CDC. (2013). Prevention and control of seasonal influenza with vaccines. Recommendations of the Advisory Committee on Immunization Practices, United States, 2013–2014. MMWR 62:1, 5, 28. CDControl and Prevention (2015). Influenza vaccination coverage among health care personnel – United States, 2014–15 influenza season. Morb Mortal Wkly Rep 64:993–999. Hollmeyer HG, Hayden F, Poland G, Buchholz U (2009). Influenza vaccination of health care workers in hospitals − a review of studies on attitudes and predictors. Vaccine 27:3935–3944. Hunt C, Arthur A (2012). Student nurses’ reasons behind the decision to receive or decline influenza vaccine: a cross-sectional survey. Vaccine 30:5824–5829. Kang J, Engberg SJ, Muto AC (2014). Survey on influenza vaccination noncompliance among nursing students. Infect Control Hosp Epidemiol 35:1316–1317. Kelly DA, Macey DJ, Mak DB (2014). Annual influenza vaccination: uptake, barriers, and enablers among student health care providers at the University of Notre Dame Australia, Fremantle. Hum Vaccin Immunother 10:1930–1934. Kosharichik LS, Salman K, Hardy E, Mayle-Towns K (2012). Influenza immunization status among nursing students. J Infect Prev 13:84–87. Douville LE, Myers A, Jackson MA, Lantos JD (2010). Health care worker knowledge, attitudes, and beliefs regarding mandatory influenza vaccination. Arch Pediatr Adolesc Med 2010; 164:33–37. Lina B (2008). History of influenza pandemics. Paleomicrobiology: Past Human Infections, ed. D. Raoult and M. Drancourt: Springer-Verlag Berlin, Germany. 199–211. Nichol KL, D’Heilly S, Ehlinger EP (2008). Influenza vaccination among college and university students. Arch Paediatr Adolesc Med 16:1113–1118. Cornally N, Ann Deasy E, Mc Carthey G, Mc Auley C, Moran J, Weathers E (2013). Student nurses’ intention to get the influenza vaccine. Br J Nurs 22:1207–1211. Ofstead CL, Tucker SJ, Beebe TJ, Poland GA (2008). Influenza vaccination among registered nurses: information receipt, knowledge, and decision-making at an institution with a multifaceted educational program. Infect Control Hosp Epidemol 29:99–106. Rehmani R, Memon J (2010). Knowledge, attitudes and beliefs regarding influenza vaccination among healthcare workers in a Saudi hospital. Vaccine 28:4283–4287. Shelby R (2012). Barriers and motivators for influenza vaccination compliance among healthcare [honors theses paper]. 59. Shapovalova N, Donadel M, Jit M, Hutubessy R (2015). A systematic review of the social and economic burden of influenza in low- and middle-income countries. Vaccine 33:6537–6544. Shefer A (2010). Healthy people 2020 update: influenza vaccination. Immunisation S‘ervices Division, Centers for Disease Control and Prevention, National Influenza Summit, May 2010: 19. Smedley J, Poole J, Waclawski E, Stevens A, Harrison J, Watson J et al. (2007). Influenza immunisation: attitudes and beliefs of UK healthcare workers. Occup Environ Med 64:223–227. Whalen D, Molnar D, Milne F et al. (2014). Flu vaccine experiences and beliefs influence vaccination decision making more than knowledge. F1000Res 3:224. Available at: http://f1000r.es/2id. DOI: 0.12688/f1000research.3018.1. Wicker S, Rabenau HF, Doerr HW, Allwinn R (2009). Influenza vaccination compliance among health care workers in a German University Hospital. Infection 37:197–202. Wong VWY, Lok KYW, Tarrant M (2016). Interventions to increase the uptake of seasonal influenza vaccination among pregnant women: a systematic review. Vaccine 34:20–32. Zeitouni MO, Barrak AM, Al-Moamary MS, Alharbi NS, Idrees MM, Al Shimemri AA, Al-Hajjaj MS (2015). The Saudi Thoracic Society guidelines for influenza vaccinations. Ann Thorac Med 10:223–230.